WPML compatible WordPress theme best suitable for education websites with easy page builder. Responsive WordPress theme for School website with Woo-Commerce support. Education Pro – The name of the theme only indicate that it is education based WordPress theme. The theme is used for creating education, institute, college related websites. The theme contains latest search engine and fast loading speed. It allows you to make your own websites with your own content and style with the help of customization options provided by theme. 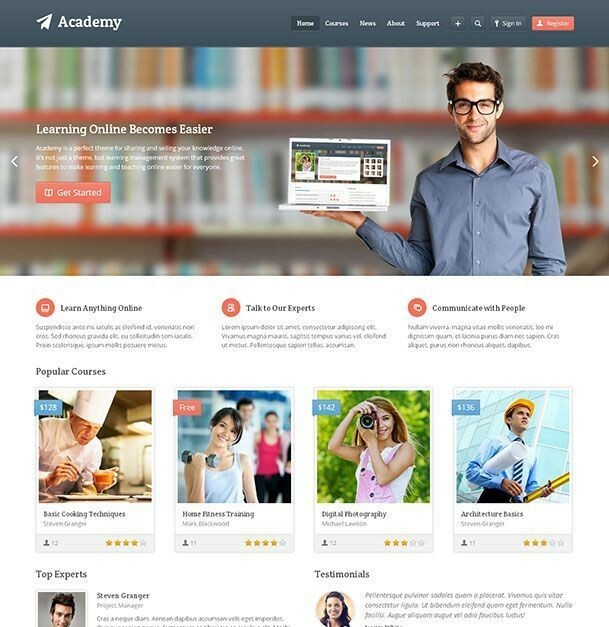 The theme is integrated with widgetized areas which allows you to add anything you want like : to know people about institutional courses available, management, fees, staff. It displays all the neccessary information on its homepage only so that the visitors searching for information could get the faster results. hence the site is made in such a way, it is called as user friendly. Full Width introduction section of the theme displays welcome message for visitors. The feature slider is supported by the theme so that you can display main posts, images and other elements. “Featured Posts” widget you can select 4 best pages of your website. Theme uses clear and minimal layout which displays lots of information, SEO friendly theme. Header contains Logo and Tagline, Social link (top), Custom Menu to display main links on header and many more features are packed. A fantastic theme with great features. I just like it’s attractive layout and customization options. I am very happy client and will always recommend this theme to others also. Thank you so much team You just made my day!! I have used this theme for my institute. I has all those features which should be there in educational theme. I am surprised with the support you guys are providing. Thank you so much keep up the work! !